Shohagh Paribahan Private Limited is the best and organized bus service in Bangladesh. They are deeply concerned about better customer service and higher passenger experience. The company prolongs its transportation business from Teckanf to Tetulia even in India. They commit to the passengers for safe, convenience, luxurious and secured journey. Passengers can travel with affordable cost in Shohagh Paribahan Private Limited. The most significant feature of the service is that they never take or carry any passenger from the mid-way. The company operates its business since 1973. More than 1500 employees and staffs are ready to serve the customers the better experience in bus journey. Shohagh Paribahan gives you the best service in exchange for the cheapest price. They have two exclusive services both AC Volvo Exclusive and Non AC Bus. The main office of the company is in 63 DIT Road Malibagh, Dhaka. Shohagh Paribahan customer care number is +880 2 9344477 and +880 2 8321425. You can call them anytime to know the information about Shohagh Paribahan time schedule and route. Address: 2 Inner Circular Road, Fakirapool. Address: 64/1 A Hotel Al-Faruk. Address: H 1/6 Mohakhali Rail Gate. With the given transport fares, extra TK 500 (per head) for AC passengers and TK 350 (per head) for Non-AC passengers will have to pay after crossing the Indian border. These buses (Calcutta Route) are departed only from the Malibagh and Arambagh counter. You can buy your necessary ticket from any counters of Eagle Paribahan. You can also book your seat over a phone call. The manager of the counter will provide your booked seat after your payment. You can also buy Shohagh Paribahan online ticket by visiting shohoz.com. Buying a ticket from online is very easy. It saves your valuable time and money. 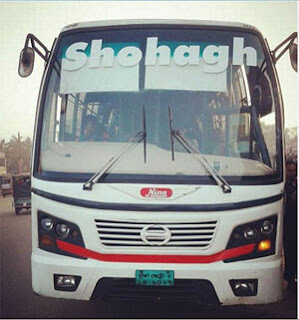 You can buy Shohagh Paribahan online bus ticket from shohoz.com. Sohoz.com offers TK 150 off for the online booking. You can visit the website and get TK 150 off. But the biggest offer is to use the app. You’ll get up to TK 300 by using the app. Just download the app and log in to book your ticket. Like Eagle Paribahan, Shohagh Paribahan provides international route service. The bus goes to Dhaka to Kolkata. You can find more information by visiting any of the counters across the country.